When I was younger, all I knew about Gegana is a bomb disposal unit. Just like what I saw in the movies. You know, cut the blue or red cable things. So, they must be show up only when there is a suspected bomb somewhere in the city. But recently I know that Gegana’s duties are more than just cut the cable or throw the bomb to an isolated, super bucket. 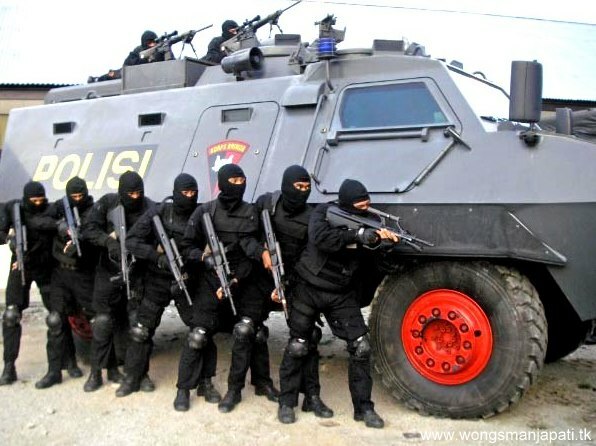 Just like Densus 88, Gegana is a sub of Brimob (Mobile Brigade), Indonesian Police Special Unit. It was formed in November 1974 as a detachment to deal with airplane hijacking. Then in 1995, the job desc was expanded to be a unit of explosive disposal operations in urban settings, counter-terrorism, anti-armed criminals, close protection, search and rescue (SAR). Each of Gegana’s personnel has to master some specialties. In SAR operation, for instance,they are required to have the basic capabilities of shooting, diving, rappelling, and first aiding. But in general, all personnel of Gegana should able to perform any tasks needed. Still, the strongest image of Gegana is an explosive tamer. After Bali bombing in 2002 (and other following bombs), people in Indonesia gets paranoid. Every time we had a suspicion on a packet or a thing, we called Gegana. Luckily, this team is always ready to go. That’s what they paid for, isn’t it? Only, most of those suspicious things weren’t bomb in fact. Some are only trash, printer, jelly, et cetera. But, it’s better to feel fooled than to feel sorry, isn’t it? By the way, The Gegana Regiment itself consists of some detachments (with about 280 personnel each), sub-detachments (with about 40 personnel each), and also several units (with about 10 personnel each). Like we used to watch in action film, one operation is usually assigned to one unit. They have special skills like EOD (Explosives and Ordnance Disposal), SAR operations, and counter-terrorist, two experts as Operators One and Two, while the rest of the unit personnel become the Support Team. There is at least one personnel of that unit that has negotiation ability. Because, the main goal of each operations actually is to arrest the suspects and drag them to the court. Unless instructed otherwise or happened to be a self-defensing situation, there will be no life elimination. Gegana and Densus 88. it’s hard for me to diferentiate the duty between them. well, sjak densus 88 tercipta. muncul ambigiunitas dtubuh paramiliter polri. lha polri udh pny unit antiteror dr brimob : gegana. ngpain bkin lg.. ? keanehan brbu politik n dana sgar dr us. Ya, dengan Kopassus rasanya juga tumpang tindih.